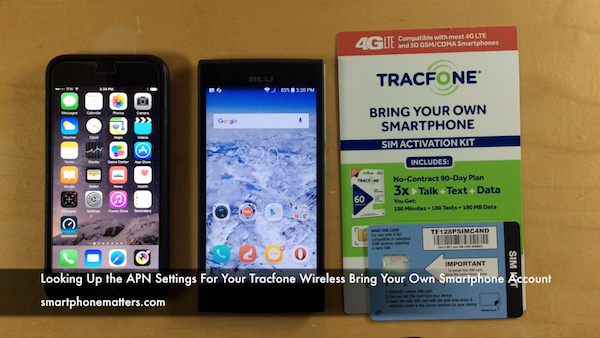 In this video I show you show you how to look up the APN Settings for Tracfone Wireless Bring Your Own Smartphone Account APN stands for Access Point Name. Your smartphone needs the APN settings to connect to the internet using your cellular data and send and receive MMS picture messages. If your APN isn’t set correctly these feature will not work. If you lucky, sometimes your smartphone sets up the APN automatically. Otherwise you’ll need to go into your phone’s Settings App and enter them yourself. It’s not that hard to do, but the steps are different depending on what type of phone you have. Free Overnight Shipping when you buy a BYOP SIM bundle (BYOP SIM + airtime card) of $20.99 or more! Before you can set your APN, you’ll need to know what settings to use for your account. You can look them up on the Tracfone website. You can do this using the Web browser on your smartphone, but the website but it’s hard to read on a small screen. You are much better off doing it from a computer, laptop or tablet. Let me show you how. On the left, you’ll see a table with your APN setting. On the right is a list of steps to set up the APN for the type of phone you selected earlier. You can try and follow those instructions or head on over to smartphonematters.com to look for one of my APN settings articles. Some readers have better luck using my guides. What if the Web Site Doesn’t Tell Me My APN Settings? If you entered your phone number and phone type into the website and saw this. It means your Tracfone Wireless account is probably using the Tracfone Verizon CDMA network. In this case, your phone should be setting up the APN automatically so Tracfone doesn’t publish the APN settings. If your cellular data connection isn’t working, the problem could be the APN or something else. Leave a reply below for help. Please don’t leave them on the YouTube video. Hi Bob, Your site is very helpful! Thank you! I sold an old phone to a friend and when she activated it, Tracfone gave her a new number, added her to my account and kicked my phone off! After 2 very long days with customer service, it seems to be working. Everything except VM. I have to dial in to get it when I used to get notifications and had Visual VM. It seems to have been lost when they made me download a new APN number thru iphone.flexserve.net. Any advice? I have an iPhone 7plus. Thank you so much! Mobile data used to work on my Tracfone LG41C but recently stopped working. Mobile data is turned on, the phone makes calls, wi-fi works normally. The phone is on the Verizon network so it does not show APN settings. Any advice to make data work again? I have a tracfone/Verizon phone that is not connecting to the internet. Can you help me get the APN and enter it in the phone. On the tracfone website I saw the Tracfone Verison CDMA (your phone does not require APN update). However, my cellular data still doesn’t work. What is the next step to fix this problem? that would depend on what type of phone you have. I just got a Tracfone LG 306G as a replacement , I can not connect to the internet with either the 3G using the data plan or with my secure Wi-Fi connection which thru Frontier formerly Verizon . I have contacted Tracfone, and as spoke with a supervisor who claimed it is a problem with my network. Which I know it is not the problem since I have several other devices that have no problem connecting with my secure Wi-Fi connection. I’m not too familar with Tracfone’s basic phones and generally write about iPhone and Android phones. Your phone’s Wi-fi and cellular data are two different things and I don’t see a connection between the two problems other than they don’t work. Is the LG 306G replacing another 306G you already had working on your Wi-Fi network? If possible I’d try turning off the Wi-fi encryption to try and see if it works. you could also try setting up a unencrypted guest network to test it or try an open hotspot somewhere to see if it works with Wi-Fi at all. Your phone supports WEP, WPA/WPA2-PSK security for Wi-Fi are you using one of these or a different standard? This phone supports wireless 802.11 B and G only, is your network supporting one of these or only N? As for your cellular data, I looked in the manual and don’t see any documentation on where to set the APN in this phone. The tracfone ATT network uses the reseller apn and their tmobile network use wap.tracfone. I also read some where you need to turn off the wifi on this phone to use the cellular connection. Is that really true. You might also try support again and try to get them to fix the cellular problem first. Use their online chat if you don’t want to wait on hold for a long time. Where do I find the minutes we purchased from Tracfone on our iPhone 6s? Hi there! I bought the iphone6 from Walmart, and am on a straight talk service plan… it transferred fine aside from not connecting to 3G or using data or allowing me to send photo and video SMS. When I went to straightalk website it says my phone number isn’t part of a bring your own phone program, but the phone I transferred from was also a Walmart straightalk phone. Idk what to do. Thank you! P.S- they sent me a new SIM card, should I have used that? Don’t let anyone use your old phone unless you have transferred your service to the new phone because it is still registered to your straight talk number. From what you told me I think your old phone was using the Straight Talk Verizon network? Do you know if that is correct? Hello Iam using an iphone 4s 64 gb using IOS 6.1.3 The phone was originally purchased in Japan and is locked onto the KDDI japanese phone company. But works on the AT&T network. Tracfone says to upgrade but iam afraid due to the horror stories ive heard.The phone works great except for Data and picture sending and receiving. I do have an iphone 5 on Verison running 7.1.2 but it only has 16 gb. A huge drop from 64 gb. I did have data and picture sending and receiving from a hack using a t-mobile sim card but ive forgotten how to do it. Any info appreciated THANKS! You can learn how to do the SIM swap with the T-Mobile SIM here. How to Setup Straight Talk Wireless Data and MMS for your iPhone running iOS 6. The article is for Straight Talk, but the process is the same for tracfone. For the ATT network, use the reseller APN found here. Tracfone APN Settings With iOS 7, the APN will set up automatically. If you use data at all the iPhone 5 would be a better choice. If you feel it is time for an upgrade, consider the tracfone iPhone SE for $159. Add a service plan and get at 30% discount with coupon TF30OFF. See Tracfone Is Selling the Apple iPhone SE for $159. If you are comfortable with eBay, sell the other two phones there to recoup some cash. I have an LG Optimus phone. I get the “This device does not require and update” message when I look up my phone at the Tracfone site. I recently switched to Signal (Signal.org) for my messaging. Since then I have not been able to send or receive multimedia message. I think it has something to do with the APN settings. Can you help. I have a new Tracfone LGL58VL that I purchased and I can connect to WIFI but not to mobile network to access the web or apps. your phoneuses tracfone’s verizon network and it should automatically set up the APN. The website in the article only seems to work for tracfone phone’s on the att or tmobile networks. Apologies. I missed this comment. Did you get this resolved? Thank you so much for publishing these articles! My cellular data wouldn’t work a while back and an agent at tracfone told me to download a profile so I did and then my data worked again. But I just recently added data to my iPhone and it wouldn’t work again. I read your article and realized that all I had to do was delete the old profile and my data would work again! I’m still confused why my data ever stoped working or why it doesn’t work when I add to it, but thank you for the helpful articles! you are welcome. Thanks for taking the time to leave a comment and share that it helped. I have a ZTE Majesty Pro. I can not send or receive photos or send a group text without receiving the message “data service is off please check”. My data says it is on. I have called tracfone with whom I bought the phone and it still is not fixed. It does not show the 4 g network logo either. Do I need to reset the APN? According to the tracfone website, I do not need to do this. Are you able to use cellular data to connect apps and your browser to the internet / web? Great article and video! Running into that notorious Verizon apn issue on my tracfone lg rebel running android 5.1… Can receive text and make calls but no mobile data. Seeing some previous comments I’m leaning towards the fact that a SIM card replacement is necessary, and if that doesn’t work, might have to wait the issue out or get a phone that you can manually set the APN on. Is that accurate? Is there anything I can try before going to get a new SIM card? Let me know when you get a chance thanks!! You can try removing your SIM, restarting your phone, then putting the SIM back in. If that doesn’t work you can try calling tracfone. Sometimes they can fix the issue in their system. Sometimes the fix will work for a few months or more. Read this article Problems with Straight Talk Wireless’ Verizon Network. Everything in that article is true for tracfone too. Try calling the number in that article for help. The support is usually better at executive resolution. If you get a chance please leave a follow up comment. Thank you Bob for all the useful information! Everytime I have to contact Tracfone, it always seems to be a hassle and they take forever, if they can even fix the problem at all. I’ll definitely be making note of the email addresses your provided. Currently I’m trying to get the internet & picture messaging working again for an iPhone 5c on the Tracfone Verizon CDMA network. After finally getting ahold of someone at Tracfone who sounded like they knew what they were talking about, she believes the SIM card is the problem and not the APN settings. To update the profile/APN settings, she had me use iapnupdatevzw.tracfone.com. I also tried your link above, neither one worked for me. I’m hoping they send me the correct SIM card this time and I get this working again once and for all. I hope they can fix it for you. I have heard of this problem several times before. Unfortunately for some it turns into a recurring problem. The problem seems to come and go in waves. I’ll hear about from people for a few months then it tapers off. If you get a chance let me know if they fix the problem as other people are going to ask me. Hi I don’t know if you have an answer. So here goes. Had trafone on my unlocked Verizon iphone s4. Worked great. Wanted to update on tracfone with an unlocked Verizon iPhone 6 Plus bought on eBay. Checked IMEI number with trafone was ok to transfer. Received a new SIM card. Spent HOURS on the phone with tracfone. No problem making phone calls but a big problem with connecting cellular data. They sent me a new SIM card and it will still not connect with cellular data. Spent hours checking setting and installing from vzwentp.tracfone.com that did not help. They finally gave up on me and told me it must be my phone. Email seller on eBay and was told in no uncertain terms that the phone was fine and tracfone needs to help me setup my network settings to gain access to their servers. So I called back one last time to tracfone and told them and they all of a sudden started looking into it again and told me to give them 48 hours and call back. I haven’t called them back yet. Need to be in the right state of mind. Thanks, I would appreciate ANY help. Remove the profile if installed, the article is for Straight Talk but you should be able to follow it. See if your data works. let me know. Unfortunately I still get the message turn on cellular data or use Wi-Fi to access data. Do you see TFW LTE top left status bar or Verizon LTE? What verision of iOS are you using? When you look in settings general, what does it say your carrier is? I have the same problem. I see Verizon LTE at the top left. iOS 10.1.1 and carrier is Verizon 26.1. Di d you install http://ivzwentp.tracfone.com Use safari on your phone on install the profile. The problem may not be the APN. Try emailing ST.CorpResolutionTeam@straighttalk.com, ask them why your data doesn’t work. Ask them to check he MPN. i have tracfone service not sure about emailing striaghttalk? The article provides detailed step by step instructions for the cases where you are and are not able to access the APN settings on your phone. Take a look at it again.